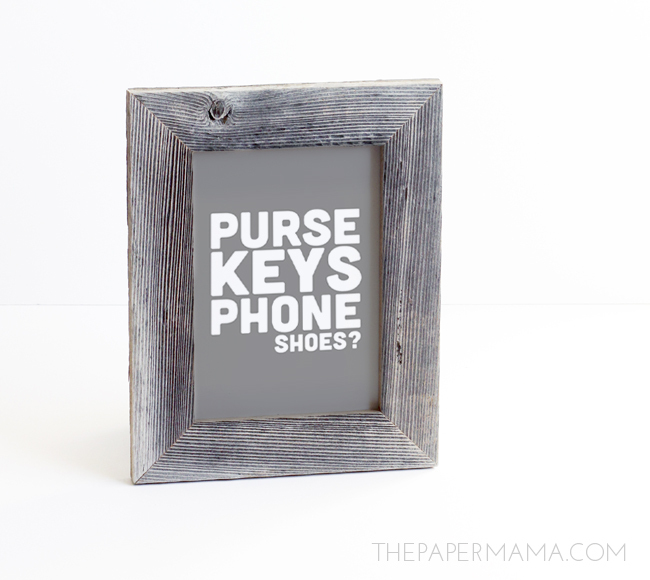 Daily Leaving The House Reminder Print: Purse, Keys, Phone, Shoes? There’s something you should know about me (or maybe you’ve already caught on), I’m a space cadet. I’m super forgetful and I can’t ever seem to leave the house prepared. I’d say 90% of the time I walk out of my house and come back in for something I forgot. That’s what this “Daily leaving the house reminder print” is for. 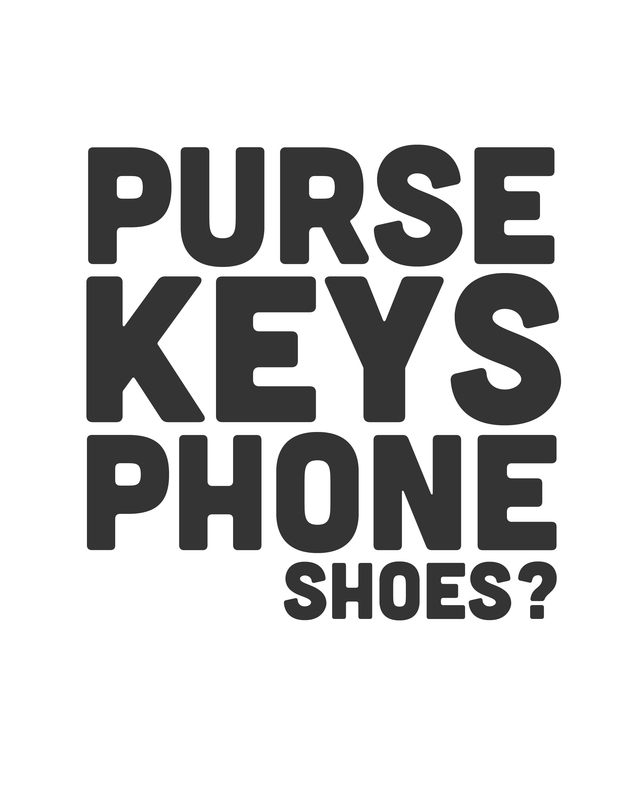 Purse? Check. 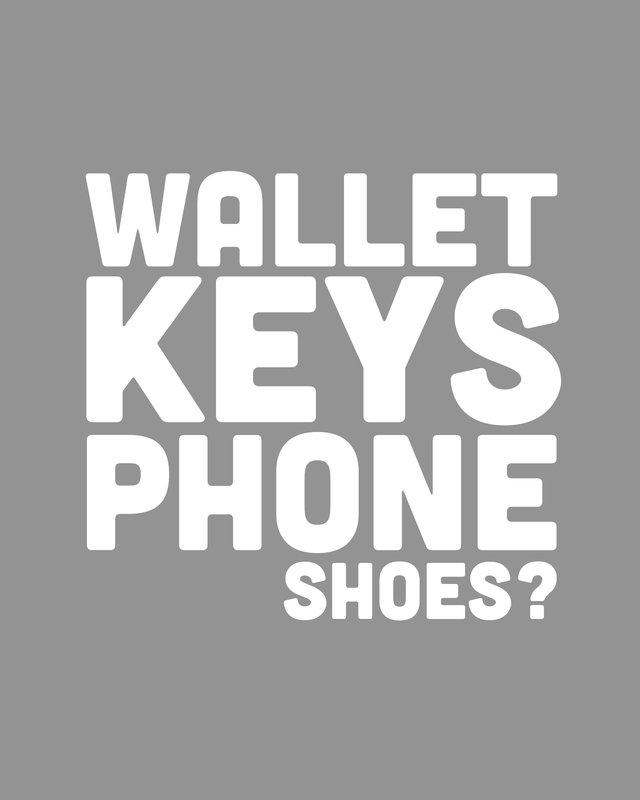 Keys? Check. Phone? Check. Shoes? Got those on, check. I should admit that one time I stepped out of the house without shoes on, but I think that was when my kiddo was a baby…. and I was seriously lacking in sleep. Ha! Oh man, memories. Anywho, I hope you’ll enjoy this print and it will help you leave the house prepared. There’s a lot more I could add to this list, but I think these are the most important items (especially those shoes). I made a couple different versions. 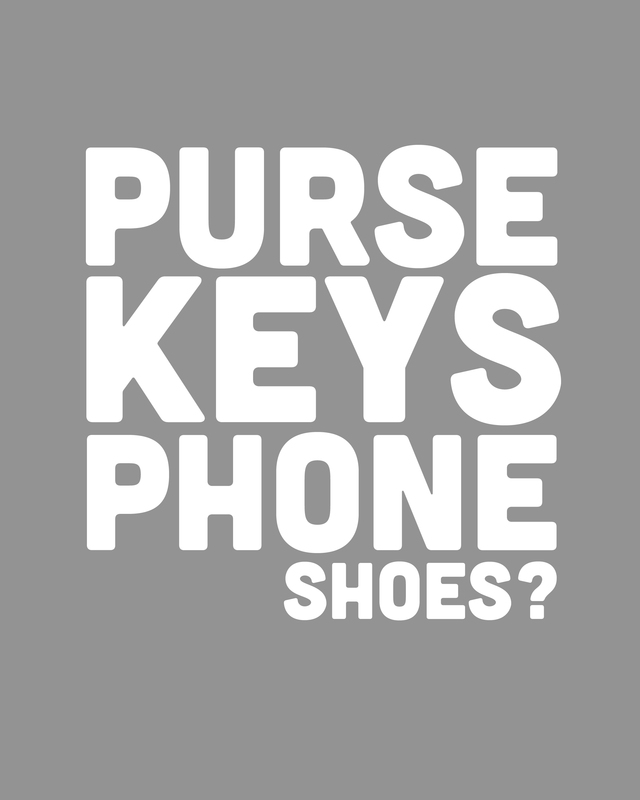 Maybe you don’t carry a purse and need to remember a wallet? I got ya covered. There’s a grey background with white font, and a white background with black font of each version. Click on one of the links below to get your own free printable for your home. After clicking on the links below, right click + save the image to your desktop. Print out on 8 x 10 size (or smaller) and hang by the front door. 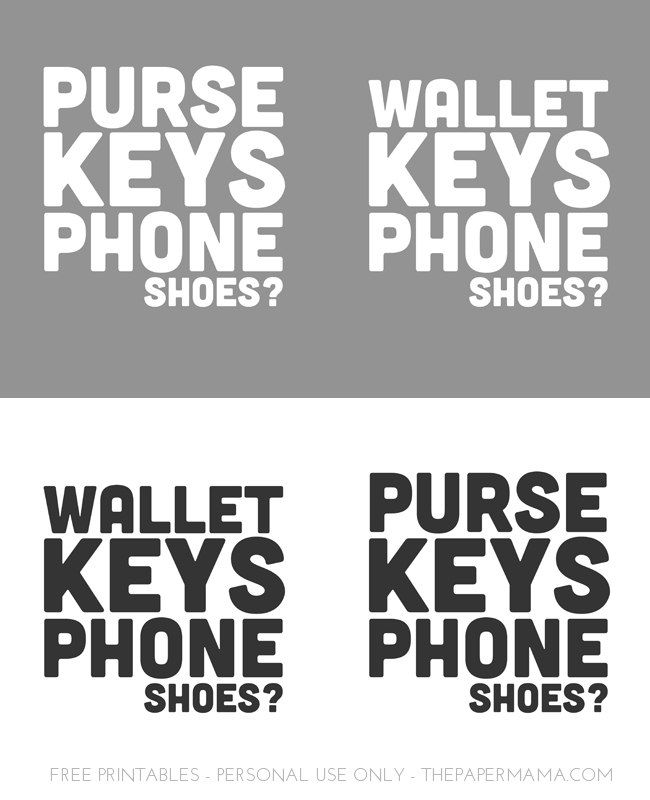 Grey purse, grey wallet, white purse, and white wallet. I hope this print helps ALL of us leave the home prepared. Absolutely love this. Fellow space cadets unite! It's a running joke in my family that I forgot my shoes for my sister's wedding. That so relates to me ,omg am I really that loud out the front,I'm pretty good but mums really bad,poor ol mum ,keep forgetting how quick the years have gone by. Thats hilarious! 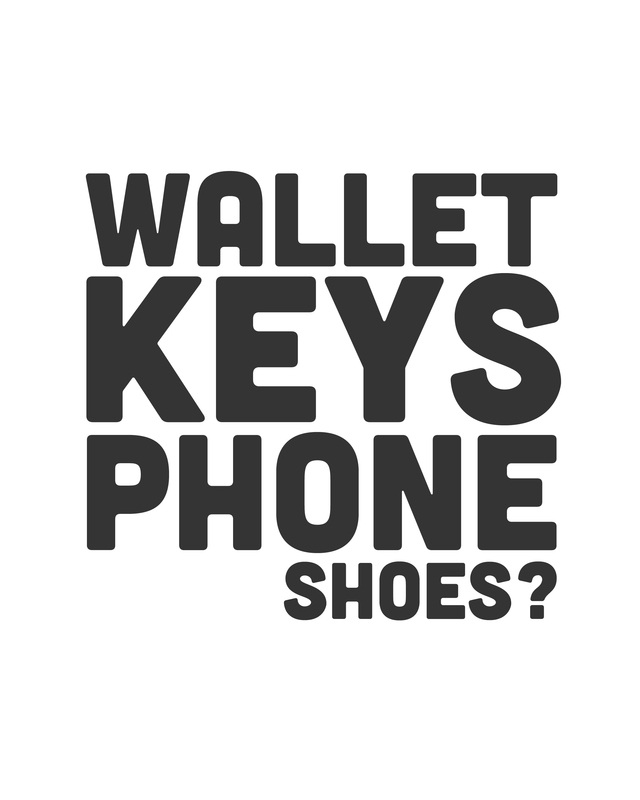 We always say "Phone, wallet, keys" whenever we leave the house. I have to say it out loud to make sure I remember it all.